Who was Mary? What was her life like? What was the historical context in which she lived? Only by learning Mary’s personal story can we find our own story. And the Advent season is where Mary’s story begins. the Son of God. And behold, your kinswoman Elizabeth in her old age has also conceived a son; and this is the sixth month with her who was called barren. For with God nothing will be impossible.” And Mary said, “Behold, I am the handmaid of the Lord; let it be to me according to your word.” And the angel departed from her. What a powerful story! God chooses Mary and comes to her with an invitation. Mary’s response to this invitation is life-changing and world-changing. What did it take for Mary to say “yes” to God? For “Pedestal Mary”—all divine perfection and poised serenity—it probably wouldn’t be that difficult. But the Mary we meet in Scripture wasn’t on a pedestal. She was fully human, a young woman “great troubled” by this encounter with God’s messenger. I have been blessed with a very rich imagination, but even I have trouble visualizing what this must have been like for Mary. 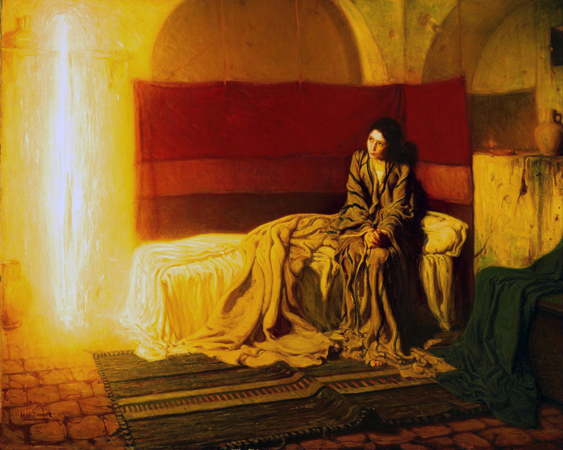 We know that Mary had great faith and love for God, but how did she feel in that moment? Shocked? Afraid? Confused? Or a glimmer of something bigger? Despite this probable whirlwind of emotions, Mary responds: “Let it be to me according to your word.” What characteristics did Mary possess that made God choose her and allowed her to say yes? She was open to God. She was willing to put her trust in him and to give up her own plans. In Mary—in this moment—we see a complete surrender to God’s will. During the Advent season we are encouraged to lay our story down next to Mary’s. Just like this young maid of Nazareth so many years ago, God chooses us and comes to us with an invitation. How will we respond? Are we open to the mystery of God’s plans for our lives? Complete surrender is not an easy thing. In battle, to surrender is bad. It implies a loss of control and a giving up or giving in. To surrender to an enemy is a failing act of last resort. But to surrender to God’s loving plans is something else altogether. Can we follow Mary’s example and take a leap of faith? Mary was asked to bring Christ into the world. As Christians, we are asked to do that very same thing. Not in the same way that Mary was, but in the way we live our lives. In the way we interact with others. In the words we speak. In the deeds we do. Do our lives diminish Christ or bring him forth? Let me hear from you! I invite you to use the comments section to share your thoughts and prayers about Mary and her Advent story.